Let’s get this out of the way. I’m a Texan. I have been a Texan since birth, so none of that, “I got here as fast as I could” stuff for me, although, one could argue arriving two weeks before my Mom was due, I was in a rush to claim being from this great state as quickly as possible. I’m also a longtime liberal, joining the club at 16 when Bill Clinton was on his way to becoming our President. In fact, one of my most cherished moments from being 16 isn’t getting my driver’s license or a car — it’s asking my Mom that if Clinton didn’t take Ohio, could I not go to school the next day. Her response? “No, Bethany, because you’ll have to face [insert name of then seated Majority Leader’s niece here] eventually. As a reminder, Clinton took Ohio and went on to win. Twice. The reason I didn’t want to go to school is that the unnamed family member of our then Member of Congress and I kept debating each day in our U.S. History class. They were heated at times, but I had the advantage of having a teacher that encouraged our debates while wishing we’d keep it to the last 5 minutes of class. So, I have a habit of taking a somewhat controversial topic for where I’m located and debating it out. My street cred intact, let me just say, I’m frustrated by the “Beto O’Rourke Rally”, but likely not in the way you’d think. It’s hard not to see the overwhelming voice of women coming to the forefront since that dark November day when Trump won the election. Women not only rose up, they started speaking up, and we started addressing a misogynistic and racist culture like never before. In 2018, I was a Beto supporter, but not a super fan. I went to the first event he had here in Houston, something I’m prone to do because I gauge a candidate’s viability. I was impressed that he’d packed a large union hall. It may even have been standing room only. I wasn’t impressed that he didn’t take questions from the audience, but I left hopeful that we could finally have a real chance at taking down the lamentable and unlikeable Cruz. We got close. We got so close. I think a lot of people outside of Texas underestimate how much of a pull for Democrats the Beto campaign had in our state. For example, in Harris County, we were continually struggling to defeat Republican judges and a Republican County Clerk responsible for our elections whose elections were held during the Midterms precisely because it IS difficult to get out the vote for anyone but Republicans in Midterm elections. That we went completely blue is in large part due to an incomparable effort waged by the O’Rourke campaign. As wonderful as the victories were on Election night in 2018, they were hollowed out by the reelection of Cruz to the Senate. That’s why this is so difficult to write. The Texas border has long been in the news, causing the longest government shutdown over a wall that would unnecessarily close the National Butterfly Center and take land away from Texans. For Trump, his vanity wall is a campaign project he wants to fulfill, and so, he headed to El Paso to headline one of his traditional rambunctious rallies, where he lies directly to people, instead of on Twitter. 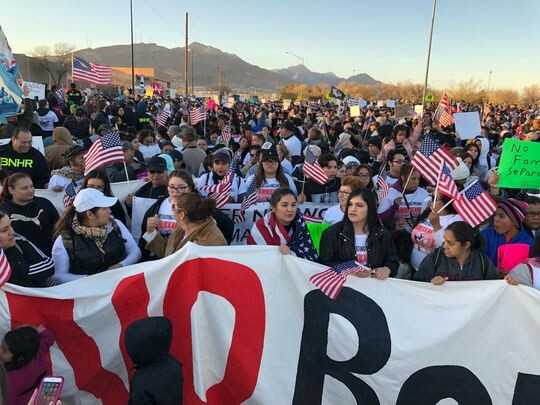 As is the nature of those on the ground, any time Trump heads out to one of these rallies, a protest is almost immediately organized by local people and organizations. Despite the media framing, this is exactly what happened in El Paso. Unfortunately, that’s not how the event has been framed, and I’m honestly angry about that. As someone that has planned rallies and political events, I’m well aware that planners do what they can to get the word out and draw a crowd. To that end, inviting Beto to attend and be a part of the rally was a no-brainer. It’s a shame that he had to co-opt it. As a politician, Beto is currently in limbo. He ran an exhaustive campaign, covering the entire state of Texas and visiting each county, something that few elected leaders of our state have even accomplished. After a defeat like he suffered, it’s understandably difficult to consider doing it all over again for the same seat, so I more than comprehend the desire to move onward and upward, especially with the momentum he built up around the country through viral social media videos. I guess that’s why watching him take center stage at a rally organized by community leaders, activists, and organizations baffles me so much. I remember watching his defense of Kaepernick taking a knee and how it garnered him the attention of Ellen. I remember his defense of Botham Jean as an innocent man, and I was proud in those moments, because Cruz was defending an alleged* murderer because she wore a uniform. However, though he talked about issues important to women, I never saw him elevate women when he could on the campaign trail. On the contrary, he drew criticism for elevating William Hurd, a Republican, over Gina Ortiz Jones, a Democrat and it was that “Beto-first” politics we witnessed on Monday Night in El Paso. As a potential leader, you have the responsibility to ensure that the people that do the work get the credit. And at no time before or since has Beto addressed the main stream media to ask that they stop referring to the March For Truth as the “Beto O’Rourke Rally”. Instead of a few remarks, Beto chose to speak for 25 minutes, centering the event on him — and removing the spotlight from where it needed to be: the people of El Paso. Leaders know that anytime you are offered the opportunity to speak, you make a choice based on whether your presence will overshadow an event or not. If your presence eclipses the issue at hand and you decide to speak at that event, you’ve chosen to put yourself above that issue. That’s exactly what Beto O’Rourke did. Frustratingly, we did not witness Beto O’Rourke speaking on immigration as a concerned citizen for a few minutes, and then turning his microphone over to Representative Veronica Escobar, the woman who won his seat in November. We saw a preemptive campaign speech, a testing of the waters, so to speak, on the preeminent issue in the news. Beto wasn’t just speaking to a crowd of roughly 15,000 El Pasoans, he was speaking to the United States, testing how he compared on the national stage to a seated President and what that coverage would say about him. And boy, did it prove everything we’ve said about the media in 2016. Ask anybody on Twitter or in the press who organized the rally and most of them will believe that it was O’Rourke and a group of volunteers. So great was the penetration that Representative Escobar took to Twitter to clarify who exactly was responsible for the event. Even more troubling than this campaign speech before a campaign announcement is the fact that Beto O’Rourke believes he deserves the national spotlight. Instead of using his energy to work towards getting other, far more qualified candidates elected who may either be a fellow Texan or any one of the exceptional women already running, we saw him impanel his own private focus group on Monday Night. And the press delivered a rounding success.